The SPA FROG® In-Line System enhances a standard hot tub up to 600 gallons with its patented delivery of minerals and a low dose of bromine. This hot tub Fresh Mineral Water® system eliminates the need for daily maintenance & chlorination, improves spa water quality and removes the unmistakable smell of chlorine, all the while reducing bromine use and enhancing your hot tub water quality. Simply snap the pre-filled mineral & bromine cartridges into the holder, sit back, relax and enjoy your hot tub. 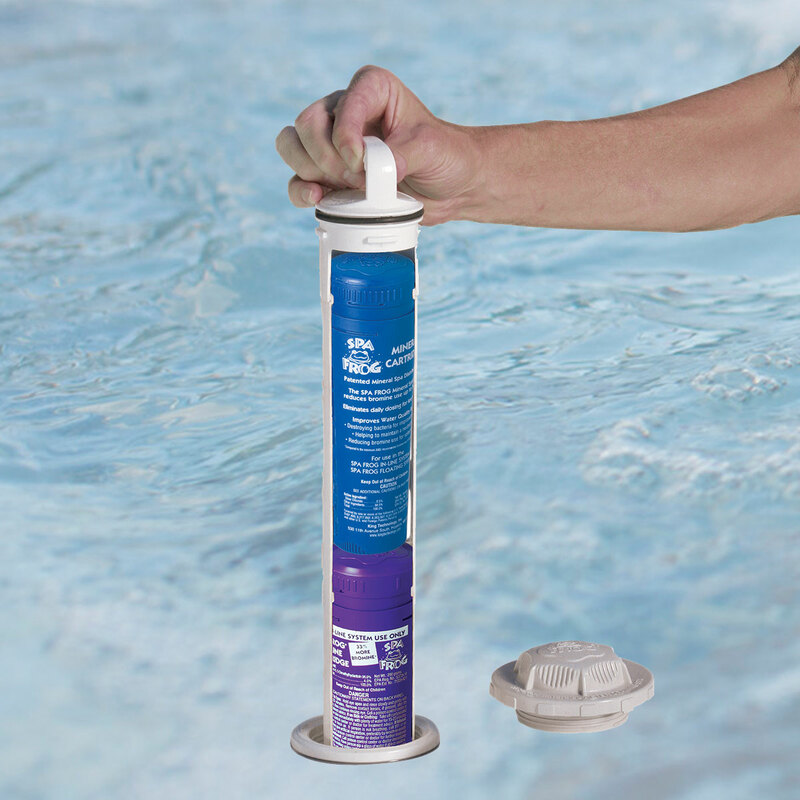 The SPA FROG Fresh Mineral Water In-Line System is part of the hot tub’s plumbing, with an easily distinguishable and convenient cap for top loading of the mineral and bromine cartridges. A simple twist and the cartridge basket is removed from the hot tub for quick and easy cartridge replacement. The entire process takes less than a minute. The minerals last a full four months set wide open, while the bromine usually lasts around three weeks with adjustable settings to meet each hot tub’s needs. *Compared to the minimum ANSI recommended chlorine or bromine level of 2.0 ppm for a hot tub.